More than 100 people, including residents and staff, attended a celebration at Sunrise of Sonning care home to celebrate its 10th anniversary. The celebrations included bucks fizz and canapés, a rendition of happy birthday and they all enjoyed cake made by chef Kevin Crook and decorate by concierge Linda Jones. The occasion was marked by the presentation of a cheque for £3,823 to Alzheimer’s Research UK. 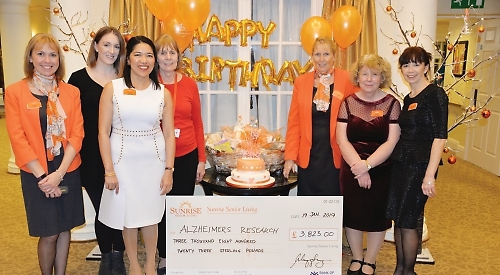 Nathalie McLeish, director of community relations at Sunrise of Sonning, said: “We were thrilled to celebrate our 10th birthday with such a wonderful afternoon.